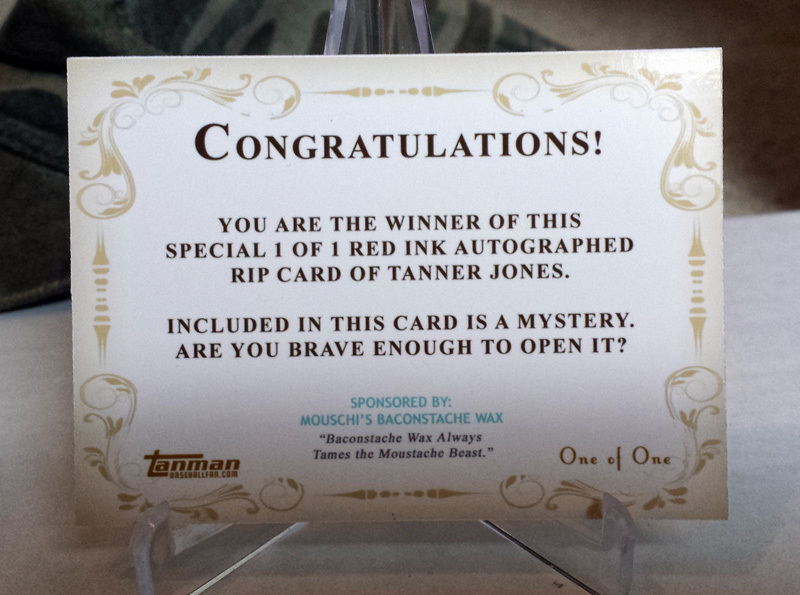 Buy My Moustache … Plus a Chance to WIN! We all knew that it was going to happen. Well, friends – the time has come. 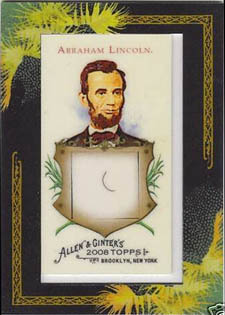 Years ago, Allen & Ginter debuted this idea with a hair from Abraham Lincoln. It was a framed mini relic. I was going to do that as well, but instead, I decided to amp it up a bit. 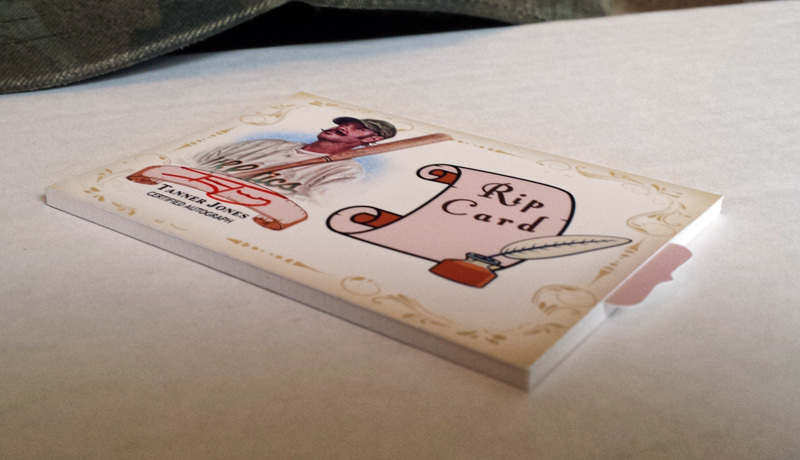 Instead of using an Allen & Ginter card, I opted for a full size card. Not only that, but I also used my own design, and sign it. Friends: straightened out, this is nearly 2 inches of manly moustache hair. The former top dog king of my upper lip. It didn’t care if I was speaking or not – it draped down past my bottom lip like nobody’s business. To top it all off, it isn’t just a piece of it. 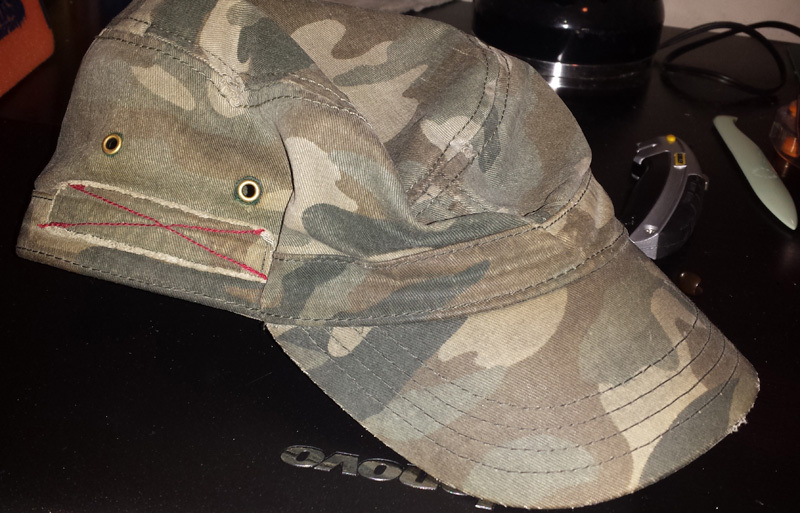 It is a tag on the underside of the cap. 1) I have posted this on ebay starting at 99 cents. 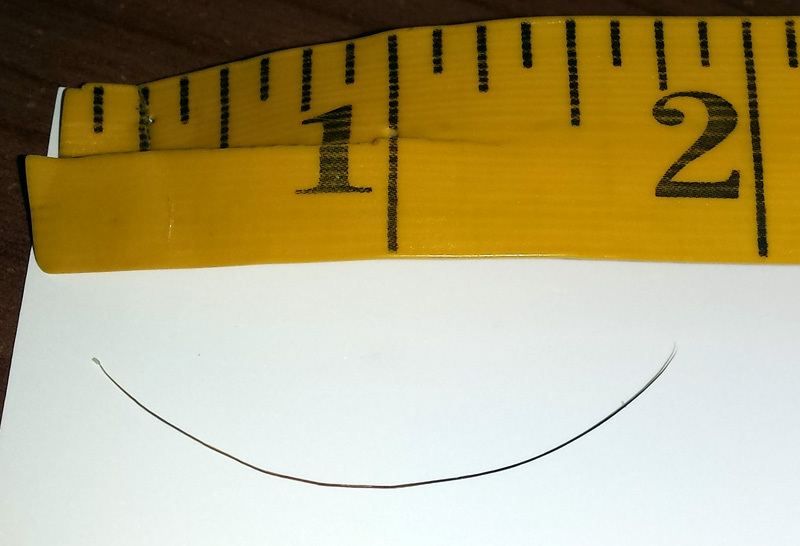 The Abe relic had a tiny piece of his hair … clearly not the alpha whisker. 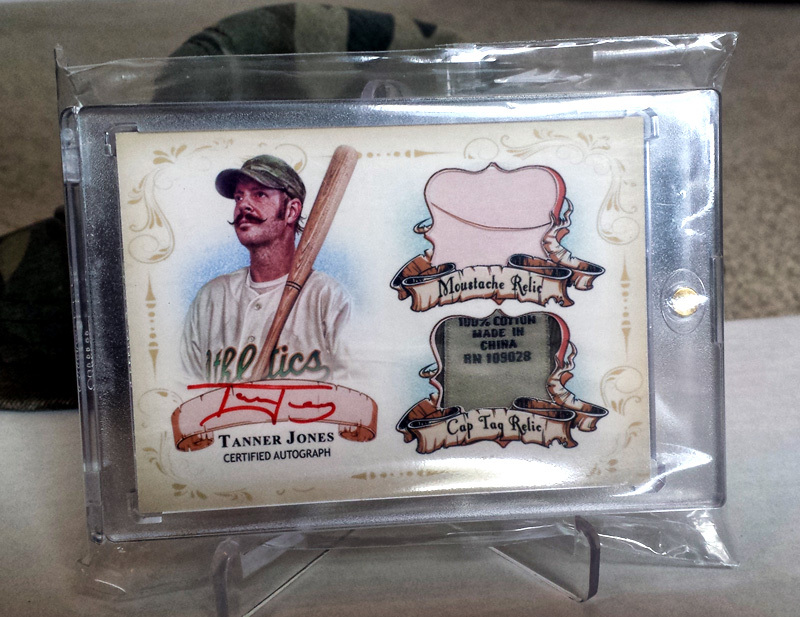 There was no cap relic, and certainly no autograph, yet it *STILL* fetched $20,000 if I recall correctly. Clearly, this *should* go for at least double. Yeah, he has the whole “former President of the United States” thing going for him, but was he ever in Beckett? I rest my case. Here is the link: http://www.ebay.com/itm/-/281741892366? – it ends in 7 days, or at around 6:35 PM CST on Sunday, 7/12/15. 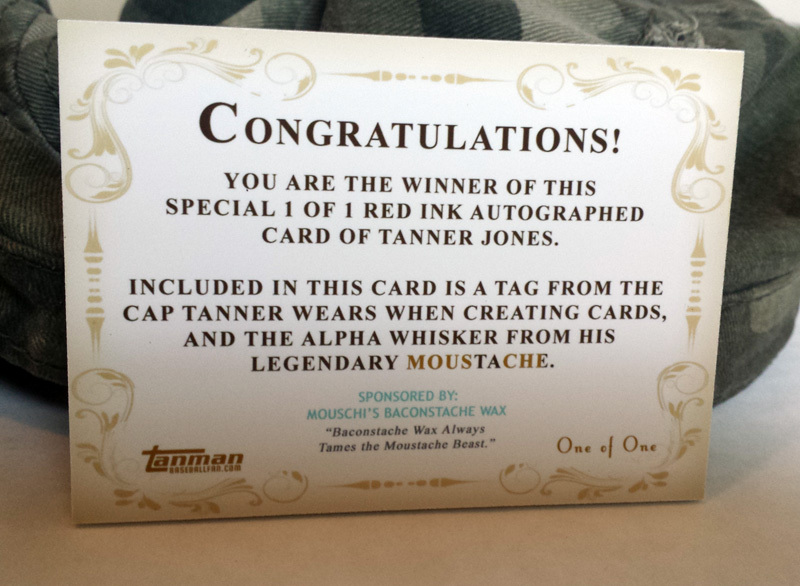 The design prototype card for the 1/1, and as you can see, it is signed as well. This uber-rare, back-doored prototype is sure to be VERY valuable. 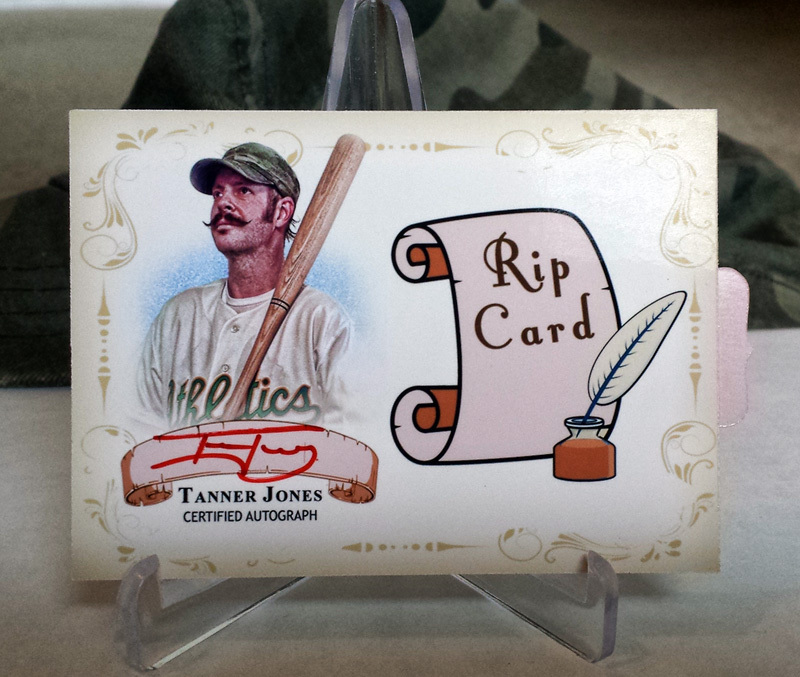 A special red ink autographed Rip Card. See the tab on the side? Rip that puppy open and find a prize…if you dare! All you have to do is leave a comment here with what your guess for the end price will be. – You can guess up to three times what the end price will be on this thread – in separate posts. If you post several guesses in the same post, only the first one will count. – The guess contest will end an hour before the auction ends. – In the event of a tie, the person who guessed closest the earliest will win. – In the event of a tie where both parties have guessed the exact end price at the exact same second, it will be settled in an internet televised match of rock-paper-scissors … to the death. – If you happen to win the card in the auction, any cloning from my DNA will NOT be tolerated. This will be posted on various forums and my blog, as well so be put on notice: You will have competition! Hopefully this will prove to be as fun and entertaining for you as it was for me to put together. Bid and guess away! Again, the link is here: http://www.ebay.com/itm/-/281741892366? – it ends in 7 days, or at around 6:35 PM CST on Sunday, 7/12/15. That's so wrong but so awesome at the same time. 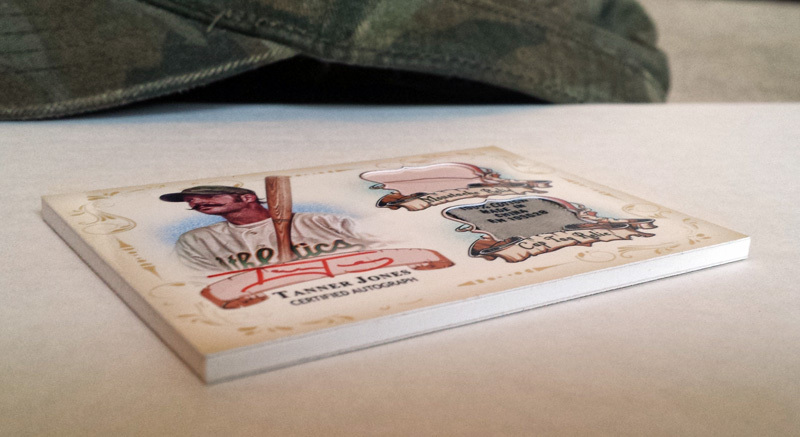 I was fortunate to hold the 2014 A&G DNA card of Hamilton in my hand. Someone at my LCS pulled it and sold it to the shop. They sold it on ebay for a decent sum, but I got to handle it before the auction ended.